studio | I Haven't Had My Coffee Yet -- Don't Make Me Kill You! Many factors can cause your stringed instrument to have intonation problems, including old strings and fluctuations in weather and humidity. Maintain and protect your instrument to keep your guitar in tune. I was chatting with a teaching colleague about a class recording project that his students were wrapping up, and he mentioned that a rock band had come into our campus studio for a weekend recording session and couldn’t manage to get their electric guitars to stay in tune. They had to live with the recordings of poorly intonated instruments, and we used it as a lesson to our own sound recording students to meet with the band well before the session day and emphasize the importance of getting their instruments into studio shape for every recording project. While the next band to come in had better luck with tuning, a few of the following ones didn’t, which prompted us to add a well-intonated Taylor electric guitar to the recording studio’s gear kit. Now, when a band shows up with guitars that are not set up properly, the students can suggest trying the Taylor, which we know has rock solid intonation. Most guitarists are happy to do so and are pleased with how “in tune” the results are. But what causes a guitar to have intonation problems? And what can you do about it if your instrument is causing you to be frustrated? How can you keep your guitar in tune? Guitars use what is known as an equally tempered scale, as do pianos and most western musical instruments. Without going into the science, the guitar’s tempered scale is a compromise and doesn’t result in 100% precise tuning or intervals between notes. Since guitars have this inherent weakness when it comes to being in tune, it’s important to develop a basic understanding of guitar intonation and adjustments to get the best performance out of your instrument. Most guitar players have a tuner of some sort, whether it’s a stomp box on the floor, an expensive rack mounted LED cascade, or a simple portable LED-model – all of which can speed up tuning and accuracy. Tuners can be helpful in diagnosing and making basic intonation adjustments yourself, which we’ll discuss. One of the most obvious signs that your instrument has intonation issues is if each string played open is in tune, but when you play a bar chord anywhere up the neck, it sounds out of tune. 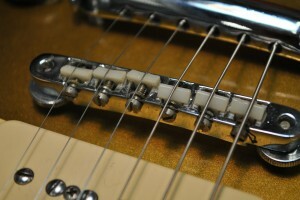 Shaun Conrad, an experienced luthier, lists some of the potential causes for guitar intonation issues on his informative website, guitarrepairbench.com. While we can’t address the full range of possible problems and solutions that spring from Shaun’s list, one of the most basic adjustments can be done by any electric guitarist with a tuner: fine tuning your saddle pieces. 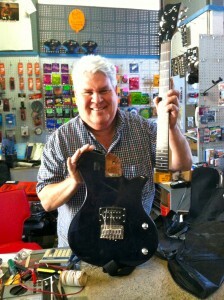 I spoke with Bill Stevens, a guitar repair expert who manages The Music Box retail music store in Stockton, CA and who has been adjusting and repairing guitars for more than three decades. “For a quick check to see how much intonation adjustment is needed,” says Stevens, “I like to use one of the guitar tuners that has a needle to register intonation and an LED that goes to green when the string is in tune. First, tune an open string so it’s in tune using the tuner, then go on up to the 12th fret and press down and play the octave of the open string. If it’s a bit flat, you can shorten the string length by moving the saddle toward the fretboard using the adjustment screw [on an electric guitar]. If the octave registers as sharp, then you’ll lengthen the string by using the adjusting screw to move the saddle in the opposite direction, away from the fretboard. 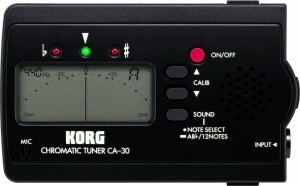 “Use the tuner to get the octave in tune with the open string. Carefully adjusting the saddle pieces in this way can help clear up some of the most typical intonation problems on your electric guitar. If you have an acoustic guitar, you won’t have individual saddle adjustments, however most manufacturers are shipping new acoustics with compensating saddles which help improve intonation. “Weather can have a lot to do with how your guitar plays,” Stevens continues. “Try to avoid extreme temperatures when your guitar is in its case. Particularly leaving your guitar in a car in summer, as it can get incredibly hot. In winter, don’t leave your guitar out in the garage or anywhere there will be extreme temperature or humidity swings. Although it sounds pretty basic, get a decent case to protect your instrument, too. Nearly every guitar sold used to come with a case of some sort, but today, many guitars don’t include a case to protect your investment. So I encourage everyone getting a guitar to at least get a soft bag. Also, don’t lay down your guitar when storing it, it’s better to keep it upright in the case, like you would store a vinyl record album. Your instrument may also require a truss rod adjustment if change to a different gauge of string and end up with action that is too high to play comfortably. Or if you want to use a lowered tuning which results in annoying fret buzz. Unlike adjusting the saddle pieces on your electric guitar, which can only affect string length, truss rod adjustment can have a major impact on your guitar’s playability. I always have an experienced guitar tech make any truss rod adjustments on my guitars. But I can check to see if I need an adjustment using two simple aids, a capo and a thickness or “feeler” gauge to measure the amount of neck relief. Start by placing a capo at the first fret on your guitar neck. Then with your feeler gauge within reach, hold down the string where the neck joins the body. Insert the feeler gauge between the string and the fret at the eighth fret. On a typical electric guitar, there should be between .3 mm and .5 mm clearance. This clearance is referred to as “neck relief.” Too much neck relief can cause the neck to have higher action in the middle of the neck resulting in poor intonation (fretted notes will be sharp) and just being hard to play. Not enough neck relief can cause fret buzzing. Conrad also states there is no one measurement for how much relief should be used. “Just like anything else in adjusting guitars, neck relief is a player’s preference. It depends on the style of the instrument and the player.” Should you want to go ahead and dive into making your own truss rod adjustments, Shaun shares detailed instructions on electric guitar truss rod adjustments. As a guitarist myself, I’ve played and owned many guitars over the years and I’m happy to say the guitars we have at home now all have very good intonation and are quite stable. Others that I’ve owned over the years were more temperamental, or fluctuated greatly with changes in weather, requiring seasonal adjustments. And while I’m comfortable checking my neck’s relief or adjusting intonation via the saddle pieces, I get a pro to do my truss rod tweaks, when needed. Hopefully, this article has helped you learn a little more about guitar tuning and intonation and you’ll have a better idea of what it takes to make your guitar more playable and in tune, especially if you’ll be using it for recording. Explains the equal temperament system of tuning in a musical instrument. A fascinating three-part article on the realities of working to get guitars in tune in the recording studio by Seattle-based engineer/producer Jack Endino. Delve deeper into the science of how the tempered scale evolved in a fascinating article by Swedish guitar guru Paul Guy. Does insurance speak make you cross-eyed? Give you a migraine? Scare the pants off you? Fear not, we’ve found a music instrument insurance translator. If you’ve ever been curious about the ins and outs of musical instrument insurance, but don’t speak insurance, our friends at GearTrack can help act as interpreters. They spoke to Thomas Riley, a music instrument insurance expert from The Anderson Group, and here’s what they learned. What’s the difference between musical instrument insurance and a standard homeowners policy? There are several differences. $2,000 is the maximum value covered under homeowners policies and it doesn’t cover professional use. It also doesn’t cover flood damage, accidents, breakage, cracking, falling, earthquake damage or loss, nor “Agreed Risk” or replacement. Your deductible comes into play as well. Most deductibles are in the $500 to $1,000 range. Translation: Your homeowners insurance is for your hobbies, dummy. And even if music is your hobby, there are all kinds of reasons to look into musical instrument insurance, like maximum value limits and damage and loss coverage. Does music instrument insurance cover damage and repair? It does, as a normal rule, though subject to the policy itself. As long as the damage is not listed in the policy’s exclusions, a musical instrument would be sent to a repair shop and the estimate sent to the loss adjuster. If the instrument suffered a loss in value as a result of the damage and its repair, this “diminished value” would be reimbursed (a very valuable part of this insurance). Translation: In general, yes. Read the fine print about what types of damage are covered. Bonus: if your gear is damaged and loses value after the repair, your music instrument insurance carrier will pay you the difference! How are quotes and values formulated? The prospect fills out the application which goes to underwriting. According to the value (either by appraisal or documented information) and the exposure (for instance, a collector versus a performer), a quote is formulated (between $.525/$100 and $1/$100). Memberships in professional organizations and high value instruments earn appreciable discounts. Translation: Insurance cost depends on how you use your instrument and how much it’s worth. They do some magical figuring and give you a quote. It doesn’t hurt a bit. 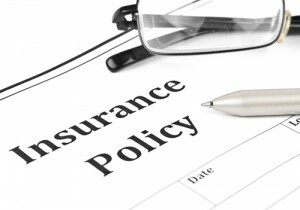 What documentation does an instrument insurer require? Many times, if we have a serial number and pictures per our guidelines, no appraisal is requested. High value and vintage instruments need appraisals. Translation: Insurers care about original and replacement value. The more expensive or rare your gear, the more documentation you should have. How do I know if I need instrument insurance? $150 per year covers up to $24,000 of scheduled items. It doesn’t make sense to spend thousands of dollars on instruments and not spend the $.40 cents per day to protect them and have the ability to replace them. Translation: If you use your gear to make money or if you have enough money in instruments (more than your low deductible), you should at least look into it. You’ll be surprised by how affordable it is. What happens once I make a claim? You file a claim stating “what, when, where, why, how, who” with dates of occurrence and a police report (if applicable). In the case of damage, an estimate from your repair shop is needed. Most claims can be handled when the repair is completed or even more promptly when a total loss or theft is involved. Translation: After you follow the five Ws (plus H), all you gotta do is get yourself a repair estimate if necessary, and wait for the check to come in. But really, that’s why you get insurance. They won’t get it back for you, but they will replace it. What if I get my instrument back after having made a claim? It is the property of the insurance company; you may refund the indemnity check and keep the instrument if you wish. Translation: Would you rather have a new instrument or your precious? Up to you. You have to give them their money back if you want your old gear. Is music instrument insurance affordable? Thanks to Thomas Riley of The Anderson Group for answering our questions. Anderson was started by a musician, for musicians. They know the difference between a violin and viola, and they understand what instruments mean to musicians.